Divorce isn’t easy on parents, but it can have life-long and negative emotional effects for children if handled poorly. Read on for some suggested ways to center a divorce on the well-being of your kids, and speak with an experienced New Jersey family law attorney with any additional questions about divorce in New Jersey. Talk to your kids about the divorce and how it affects them: When you tell your kids about the divorce, make sure that they understand how much you and your spouse still love them and will provide them with a safe familial environment. Reassure them that they won’t need to choose between having a relationship with either you or your spouse. If possible, it is best to have this conversation with your children together with your spouse, and to discuss what you want to express to them beforehand. You may also want to consider putting your children in therapy for a time after you decide to divorce, providing them with a chance to discuss their feelings with a neutral party. Consider a living arrangement that provides stability: Some families go to lengths to allow their children to remain in one home, with the parents cycling out of that home to a separate apartment. If tenable, consider living in separate parts of the home you shared with your spouse to reduce the stress caused by living out of a suitcase for everyone concerned. Choose your timing carefully: Make a deliberate choice in when you decide to divorce. 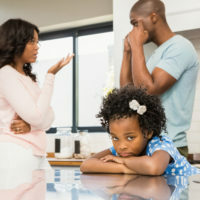 Some families feel that it is easier on children to divorce during the school year, so that children have a distraction from the pain of a split and the support of their peers. Others choose to divorce during the summer to avoid causing interference with their children’s school work. Create a written custody and alimony agreement early: Ensuring that the residential parent has the financial support they need to care for the kids, and that the non-residential parent knows when they will get to spend time with their children, will reduce conflict and keep your kids on a predictable schedule. Keep fights away from your children: Research has shown that it isn’t the mere fact of a split which makes divorce hard on kids; it’s the tumultuous and conflict-filled home life created by constantly-fighting parents that leaves a lasting negative impact on kids. Keep this fact in mind and keep fights away from children. If you’re unable to see your spouse without wanting to do battle, minimize in-person meetings and communicate in writing instead. Collaborate on as much of your split as you can: While it isn’t always possible, try to approach your divorce as collaboratively as possible. When you focus on reaching agreement with your spouse rather than on fighting with and beating them in court, it will be easier to continue co-parenting with that person instead of only viewing them as the enemy. For assistance with a family law matter in New Jersey, contact the seasoned and dedicated Union family law attorney John B. D’Alessandro for a consultation on your case, at 908-964-0102.